Hackers that have distributed cheat programs for StarCraft II are in deep trouble with Blizzard, and the law. 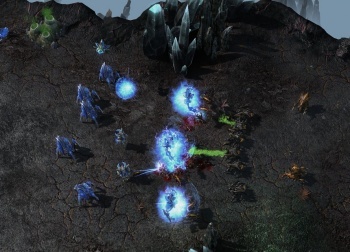 Blizzard recently made headlines for banning StarCraft II players that used third-party cheat modifications in single-player games. Now, Blizzard is taking its fight to the creators of these kinds of modifications with a lawsuit. The suit was filed in a Los Angeles district court last week against three programmers Blizzard accuses of creating StarCraft II "hacks and cheats" that it says are "designed to modify (and in fact destroy) the StarCraft II online game experience." Blizzard justifies its suit by alleging that the cheats infringe on the company's copyrights. Blizzard is demanding to be awarded damages and disgorgement of any money earned from the sale of these StarCraft II hacks, and wants them to be removed from every location under the court's jurisdiction. "By distributing the hacks to the public, defendants cause serious harm to the value of StarCraft II," Blizzard wrote in the suit. "Among other things, defendants irreparably harm the ability of Blizzard's legitimate customers (i.e. those who purchase and use unmodified games) to enjoy and participate in the competitive online experience. That, in turn, causes users to grow dissatisfied with the game, lose interest in the game, and communicate that dissatisfaction, thereby resulting in lost sales of the game or 'add-on' packs and expansions thereto." If history is any indication, things will not end up well for Blizzard's targets, whom live in Canada and Peru and go by the aliases of "Linuxawesome", "Cranix," and "Permaphrost." In recent years, Blizzard has become known for going after those it believes are causing harm to its games, including gold sellers, the creator of World of Warcraft bot Glider, and World of Warcraft private server owners. All were summarily destroyed by Blizzard's might, including an $88 million judgment in one case, so Permaphrost is likely shaking in his grav-boots right now. There's nothing more annoying than a hacker or a cheater when you're playing a game straight, so I have to say I'm glad to see Blizzard taking care of business.